This crusty, rustic bread is made in a cloche which gives it a European style texture and crust. It’s incredibly easy to do, even for a beginning bread baker, and will take you just under two hours start to finish. If you’ve never used an ceramic cloche for bread making you are in for a real treat! You’ll be making your own artisan bread in no time! 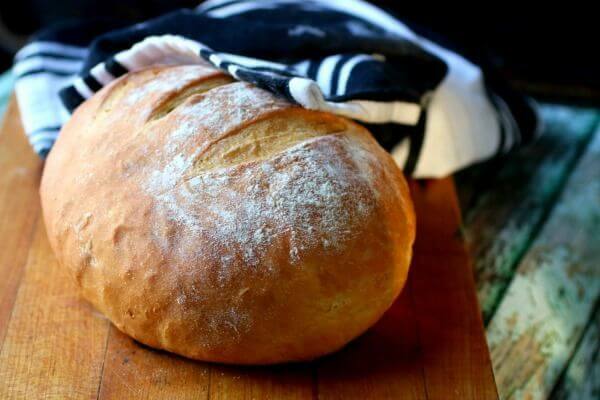 I’ve said it so many times here on Restless Chipotle – I love making bread. I think it’s one of the most relaxing things I do and it leaves the house smelling even better than those expensive candles I have sitting around. 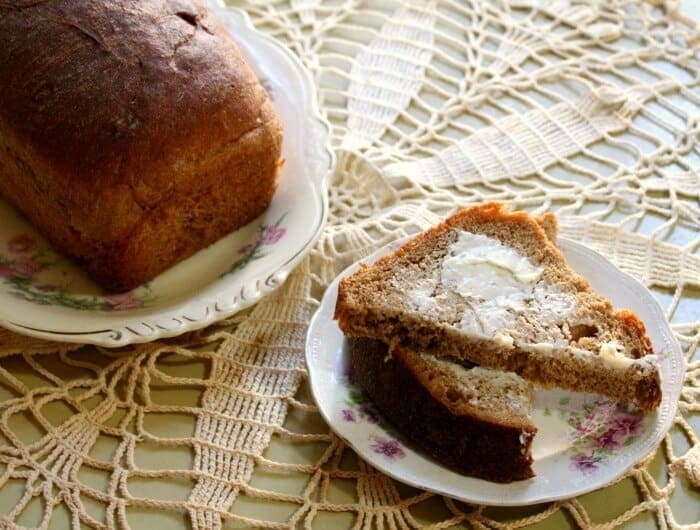 Besides, who doesn’t like a warm slice of homemade bread? The thing is that sometimes, when you’ve got a recipe you like :::cough honey buttermilk bread cough cough::: you get in a rut and constantly make what you know rather than trying something new. Please tell me it’s not just me? Surely some of y’all like strolling along in your ruts as much as I do? 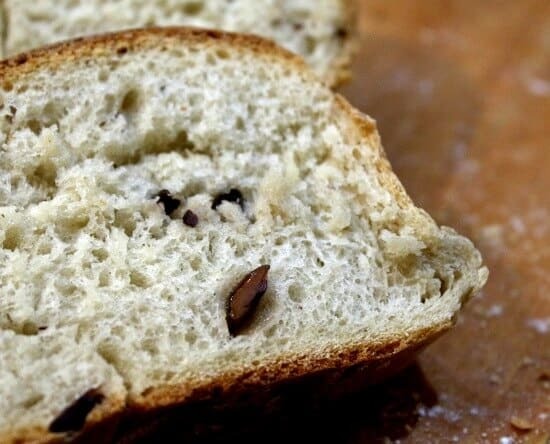 This rustic bread is a crusty, European style artisan loaf that is ridiculously easy to make. AND it’s easy to create a variety of flavors of bread once you have the technique down. There are some misconceptions about artisan bread but I’ve got you. 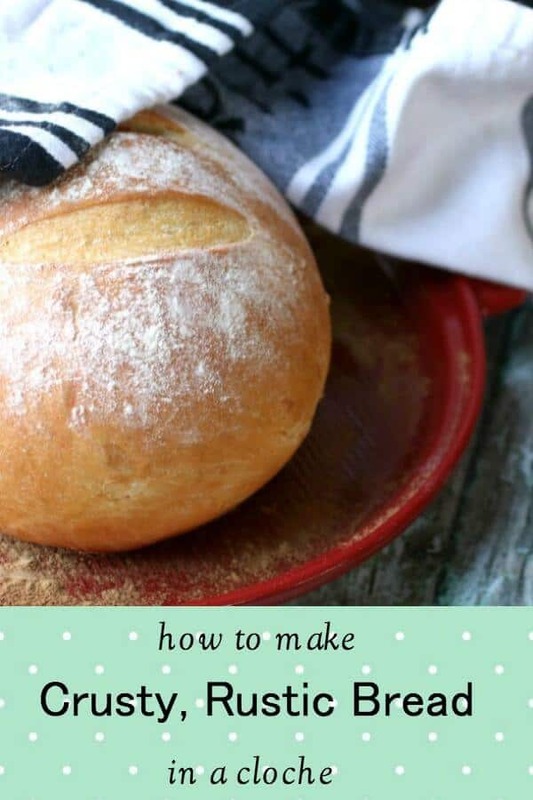 Here are the answers to some common questions and you may want to read my series on yeast bread baking tips before you get started. When people say rustic bread they most often mean a round loaf with a crispy crust. It often has an open texture and, some people believe, it must be made with just a few ingredients and a starter such as sourdough or a biga. For our purposes we’re calling it rustic because it’s got the round shape and crispy crust. How do I make my bread crusty? Steam in the oven is what gives artisan, European, and other rustic bread recipes their signature crispy crust. You can throw some ice cubes on the preheated oven floor, add a pan of water, or use a cloche like this recipe. The beauty of using the cloche is that the bread creates its own steam as it bakes and the steam is trapped in the cloche with the bread. 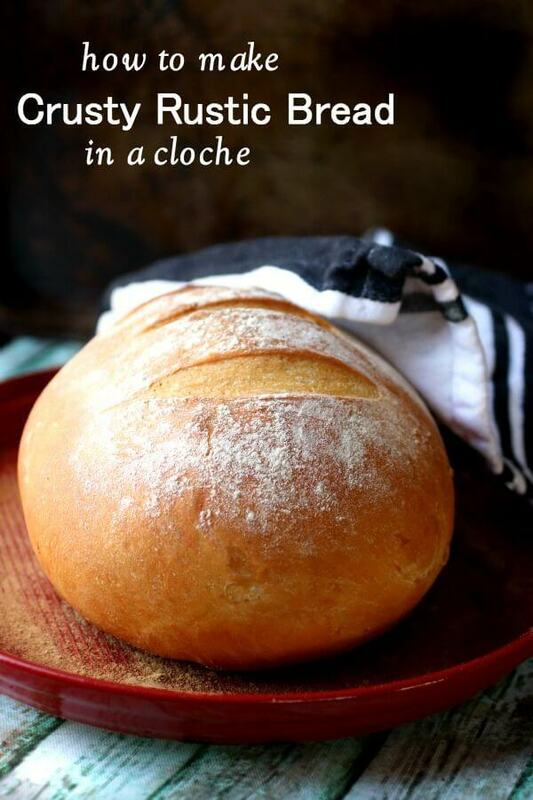 What is a bread cloche? A bread cloche is a bell shaped container that’s generally made from ceramic. It holds a loaf of bread as it rises and then you bake the dough right in the covered cloche. The steam generated by the baking bread is trapped in the cloche and emulates the fancy steam injected ovens the professionals use to create artisan loaves with crispy crusts. Can you make this rustic bread recipe without a cloche? 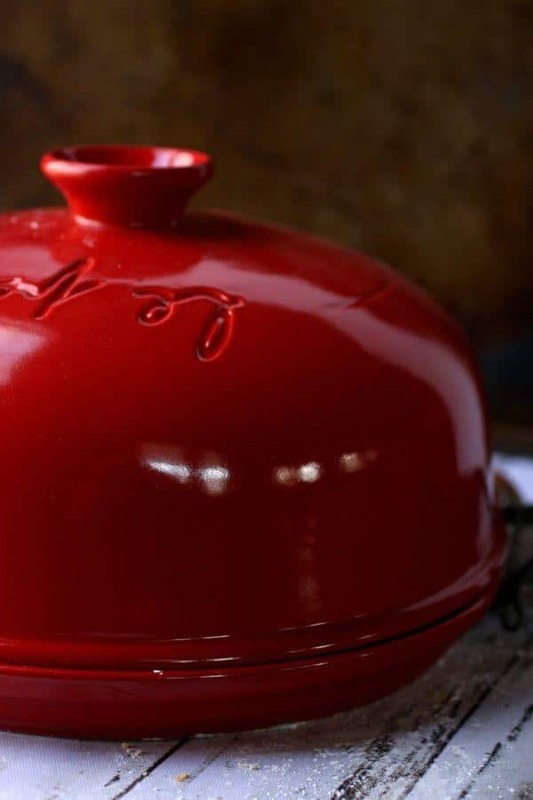 You can substitute a dutch oven for a cloche but it isn’t ideal. There are so many possibilities — you’re sure to come up with your own favorites! This is the exact bread cloche that I have and I absolutely love it! It’s so beautiful – perfect for hiding treats in when I don’t feel like sharing. You’ll find more great products for your bread baking adventures in the Restless Chipotle & Co. Storefront! 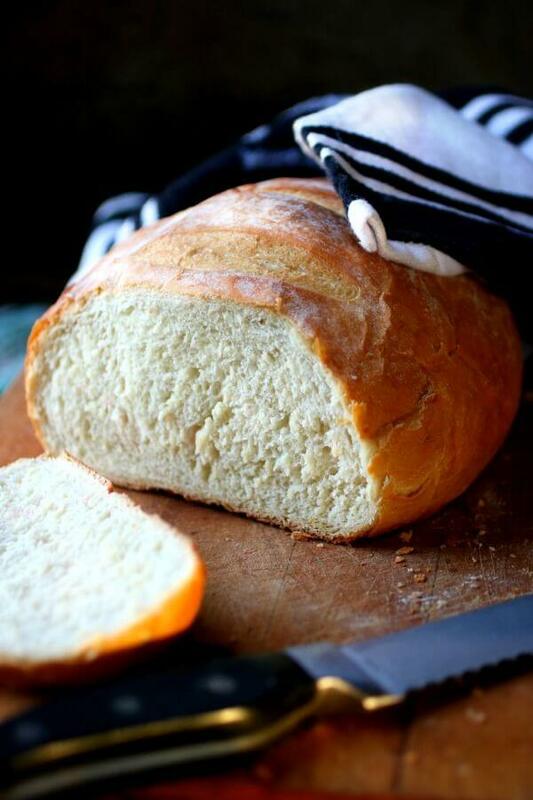 You’re definitely on your way to a loaf of artisan bread perfection with this recipe! Try it once – it’s just so easy! If you love this recipe please give it 5 stars. 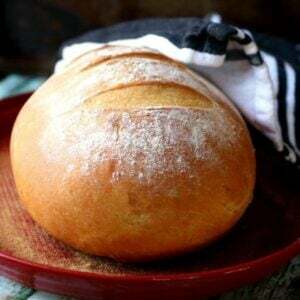 Bread baked in a cloche has a crusty exterior and a tender interior that's more like the European and artisan breads.This easy, basic loaf is a great way to jump in to cloche baking. Add the yeast and the sugar to 1/4 cup of the water and stir until blended. Set aside until foamy - about 3 to 5 minutes. Add the remaining water to the yeast mixture. Stir in 1 cup of the bread flour and the gluten. Add the remaining flour, a little at a time, until the dough pulls away from the sides of the bowl - you may need a little more flour or you may not need all of the flour. Knead in your mixer according to manufacturer's instructions. Turn the dough out onto a lightly floured surface and knead for 5 minutes, or until the dough is firm and elastic. It should feel like your earlobe when you pinch it. Form into a ball, place in an oiled bowl, cover with a clean, damp cloth, and let rise in a warm place for 45 minutes, or until it's doubled. 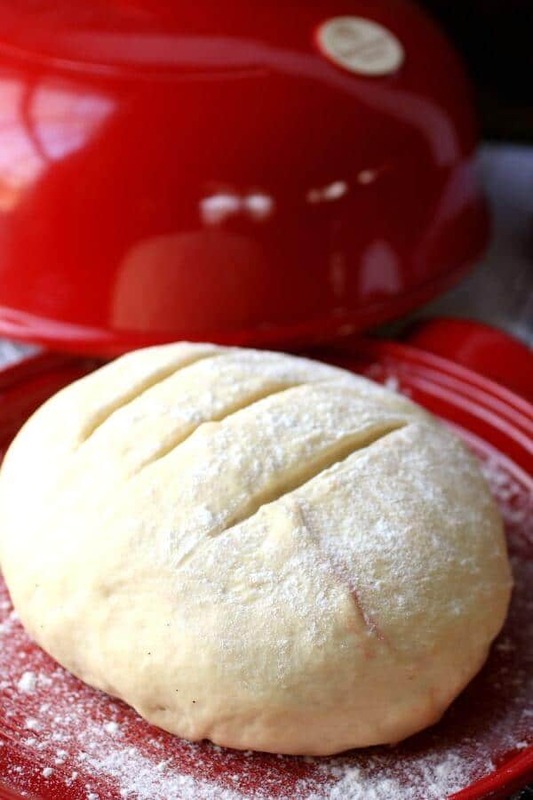 Gently deflate the dough and knead lightly. Sprinkle flour on the bottom of the cloche. Form the dough into a ball and place on the floured bottom of the cloche. Cover with the cloche top and let rise 45 minutes. Dust with flour and score with a sharp knife or baker's blade. Cover with the cloche top and bake for 35 minutes. Homemade bread doesn't keep very long. If you won't finish it in about 24 hours plan on slicing it and freezing it. Just click the image to go to the recipe! This recipe is part of Meal Plan Monday – Check it out! « Jezebel Sauce Jazzes Up National Corn Dog Day! Im searching the net and books for ideas on baking my best bread possible. 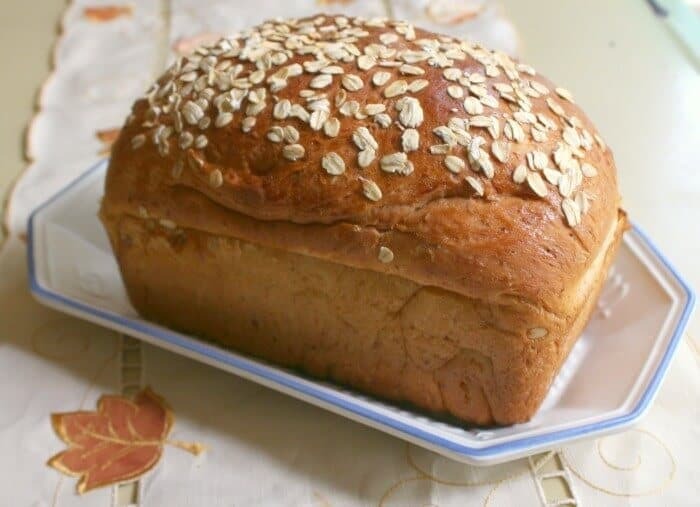 How did you keep the flour on top of the bread from browning in the oven? I’ve used the same temp and hearth style baking method. I’m at a loss and any help you can offer would be greatly appreciated. Using the cloche helps a lot since it’s covered. 🙂 You might try tenting the loaf with aluminum foil.